What Are the Benefits of Apricot Kernels? By their very nature, fungal infections can cause all manner of problems. If your digestive tract becomes overpopulated with fungal organisms like candida or trichosporan, a systemic infection can soon occur. Several approaches remain popular in the treatment of such conditions, with grapefruit seed extract amongst those most regularly used. Naturopathic medicine—such as grapefruit seed extract—promotes a holistic approach to health with minimal use of surgeries and drugs. Please consult your physician before attempting naturopathic remedies at home. When any yeast population becomes overgrown, it can shift from its standard cellular state into a pseudomycelial form, a strand-like configuration capable of penetrating the intestinal wall. As well as inflammation in the digestive tract, this may increase the likelihood of allergic reactions and the translocation of fungi into the bloodstream; Dr. William Crook, the author of "The Yeast Connection," explains how this becomes the basis of systemic fungal infections. Symptoms include fatigue, impaired thinking, headaches and rashes. Although in popular use in naturopathic treatment of yeast infections, the profile of this nutritious extract grew primarily as a result of the research of Dr. Jacob Harich. The Einstein Laureate scientist and immunologist noticed its use among many traditional societies and examined grapefruit seeds to discover why antimicrobial effects it possessed. His studies revealed a massive array of beneficial compounds, including vitamin C, sterols, tocopherols, citric acid, liminoids, hesperidin and naringinen. 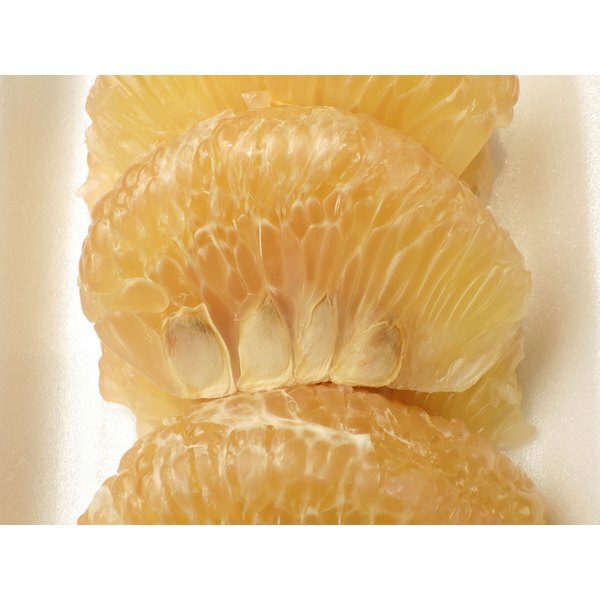 Grapefruit seed extract displays a strong antiviral, antifungal, antibacterial effect that can measurably improve the balance of intestinal bacteria. It also shows strong antioxidant activity and researchers from Vanderbilt University consider it a versatile and powerful nutrient for supporting the immune system function. The positive effects center around naringenin, the acidic flavone considered as the active compound, which fatally damages the cell walls of yeasts. Grapefruit seeds are rarely used for medicinal use. Instead, health food shops tend to offer grapefruit seed extracts in the form of capsules or concentrated liquid extracts. The extracts are ideal for applying to fungal infections that effect your skin and both swallowing when diluted in water, although the capsules may represent a more convenient choice for others. Dr. Rodger Murphree, a board-certified chiropractic physician who has written five books on dealing with difficult medical problems, encourages his patients to use grapefruit seed extract but recommends on the basis of dosage rather than form. It appears that the effectiveness of capsules and liquid extracts are identical when consumed orally. You may experience some noticeable side effects when using grapefruit seed extract, especially if using a low carbohydrate diet at the same time. Both of these steps increase the rate at which fungal cells die, releasing a wave of fungal toxins into the bloodstream. Crook points out that this wave may cause the infamous die-off reaction, sometimes referred to as the Herxheimer response. Temporarily reducing the dosage of grapefruit seed extract may help reduce these symptoms as it allows fungi to die at a more gradual rate. A London-based personal trainer, nutritional therapist and allergist, Marek Doyle runs Blueprintfitness.co.uk and counts world champion athletes and TV personalities amongst his clientele. He has contributed to various publications, including Good Life magazine, Natural News and PTontheNet. Does Drinking Grapefruit Juice After Meals Help You Lose Weight?